Most major network vendors showed up to Futurecom in Rio, Brazil this week, with their booths highlighting their regional priorities and strategies. Mobile network coverage and capacity enhancements were one common theme, doubtless seen as a regional opportunity with the upcoming World Cup and Olympic events. 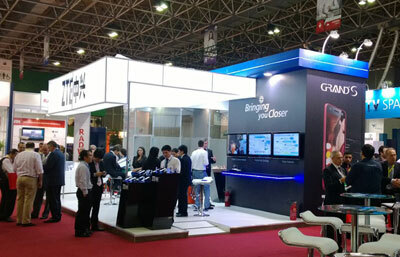 Did you or any of your colleagues make it down to Futurecom in Rio Brazil this week? If not, don’t feel bad; we had never made the trip before, largely based on the notion that it’s regional in focus, a long way away from where most of our analysts are based and we weren’t sure we would be able to get them to come home after a few days in Rio. With NSN hosting its Global Analyst Conference in Rio on the eve of Futurecom this year, it was a great opportunity to finally make the trip. Unlike most trade shows we attend, I didn’t set up a raft of meetings. Instead, I set out to get a better grasp on regional dynamics vs. some of the sessions and take the pulse of how vendors were positioning themselves. The rather relaxed Brazilian atmosphere made photo snapping much less frowned upon than in some shows, so enjoy a quick recap of what I saw – or didn’t – from the major network suppliers. More than just a nice set of pictures, take it as an input into where your vendors are putting their efforts, R&D and messaging… in Latin America, yes, but also something they should be able to talk about elsewhere. After talking a bit about booth layouts (what level of resources were spent and what message did it send), we outline the topics each vendor came to talk about, as indicated by the demo pods their booth contained. Layout: Most of the major infrastructure vendors were in the same aisle, with Alcatel-Lucent at one end. 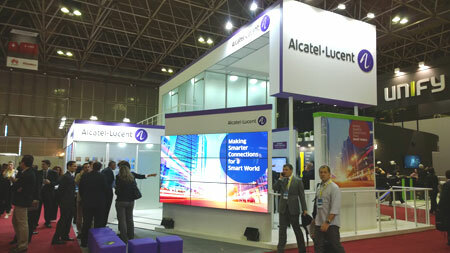 Seemingly focused on meeting rooms, outward-facing displays created something of an ‘exclusion zone,’ though nobody was kept out and pods made it clear to any passerby what Alcatel-Lucent was ready to talk about. Pods & Topics: Three areas seemed to dominate – content, the enterprise and small cells. While the enterprise content was off to the side (digital signage, mostly), the content focus included WebRTC, Alcatel-Lucent’s ‘Smart Plan’ offer and mobile video control. lightRadio topics included cellular integration (WiFi), site selection and deployment. In a country where everyone is questioning preparedness for the World Cup (2014) and the Olympics (2016), focusing on capacity enhancing small cells made sense. Layout: Less a booth than an open set of demo pods stretched out with a digital backdrop simulating various locales (like a subway train) and meeting rooms on top and at the end. 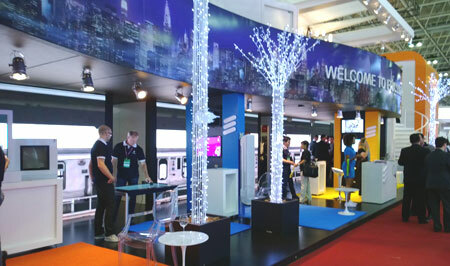 Unlike a traditional booth, or Ericsson’s MWC presence, it invited interaction. Pods & Topics: Like Alcatel-Lucent, you could separate Ericsson’s themes along three lines – radio, network optimization and network management. The new Radio Dot and the AIR 32 were present, playing to local concerns about coverage/capacity in-fill, spectrum scarcity and regulations around site building. Big data and SON optimization spoke to the need for efficient operations and networks. Playing to its strengths, professional and managed services dominated the presence, with topics including key event services, MBB management, managed end-user service assurance and managed services. Again, the theme of local operators needing help with upcoming traffic demands was clear. Layout: Huawei spent a lot of money on Futurecom beyond its booth; it seemingly sponsored the show’s registration. Its booth, however, was a spread-out affair with registration and meeting rooms at the end. 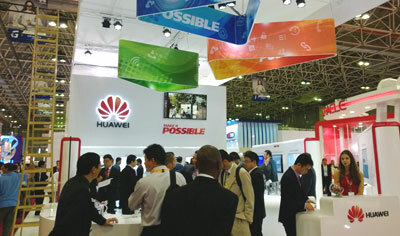 Pods & Topics: Huawei is present in many, many parts of telecom and its booth represented this. Discerning a common theme would have been difficult among: enterprise ICT, M2M, connected home, group social responsibility and key event assurance. ‘Smart cloud’ (monetizing data, open network capabilities and service agility) and ‘smart pipe’ (LTE, hetnets and deployment examples) were major themes, if only because each had several pods. None of this, however, could match the rows of devices Huawei was showcasing – fronted by the flagship Ascend P6. Layout: Like Huawei, two levels on one end and a single level on the other end provided meeting space for customer and technology-specific engagements. Having the NetCracker booth adjacent helped to showcase NEC’s solution breadth. Pods & Topics: LTE small cells, services focused on stadiums, SDN, network operations, iPasolink (mobile backhaul), digital signage – while many of the themes were common, NEC’s focus on SDN helped to set it apart, with large, outward-facing signage helping deliver a needed reminder of the diverse market in which NEC plays. Layout: Less a booth than a space for interacting with customers… and the odd press or analyst riff raff. 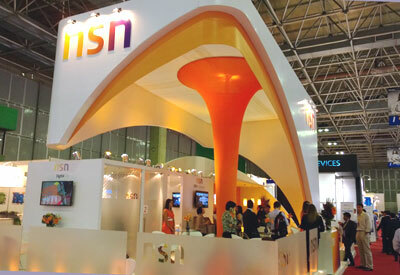 Reminiscent of Ericsson’s previous strategy of setting up a place just to engage around customer issues, the architectural simplicity and bold colors didn’t do NSN’s branding efforts any damage. Pods & Topics: With an open-ended booth (both literally and figuratively), you’d like to think they were ready to talk about any topic. Layout: Small, square and rather sparse, ZTE’s presence was a combination of meeting spaces and topic areas, all on one level – giving it about one-half to one-quarter the space of rivals. Pods & topics: A display at the corner of the booth put devices up front, including the flagship Grand S. Behind the display, topics stretched from the enterprise (unified communications) to network operations and deployment (‘easy network’) to multi-standard and multi-access capabilities (‘any service strategy’). While the displays managed to capture most of ZTE’s portfolio in a few topics, most weren’t consistently manned. 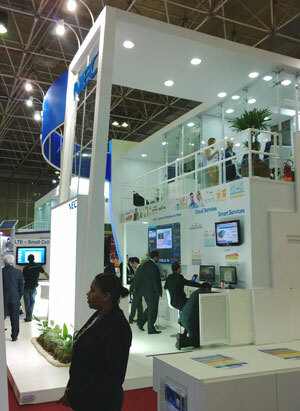 Cisco was a Master Sponsor of Futurecom, along with vendors such as NEC, IBM and Juniper; it didn’t have a booth. Samsung neither sponsored the event nor had a booth. At a time when vendors tell us that the myriad of industry events increases the need to strategically allocate trade show expenditure, neither company might be faulted for failing to appear on the show floor. Yet, both have reasons that would have justified the trip. Concerns around capacity and coverage planning for upcoming events, for example, provide a stellar platform for Cisco’s drive around carrier WiFi and small cells. Likewise, if Samsung truly aims to be a top-tier networks vendor, it must seize every opportunity to tout its capabilities and commitment to the market. Many thanks for the recognition of our effort to deliver an event of excellency. We’re glad you attend this year’s edition and took the opportunity to prove how worthy Futurecom is, just for it, for you and all IT professionals to come, to network and to make business. One thing we must say about your review is the fact that CISCO, although didn’t have a booth, had an intense presence at the event. The company chose to have a business suite at the Mezzanine 3 where many meetings were held. Instead of booth exhibiting, Cisco preferred business meetings at private and customized rooms to host and meet clients and partners. Cisco also had representants at the panels on the International Congress, as you most probably noticed and attended. We look forward to see you again next year at São Paulo. Fell free to contact us.